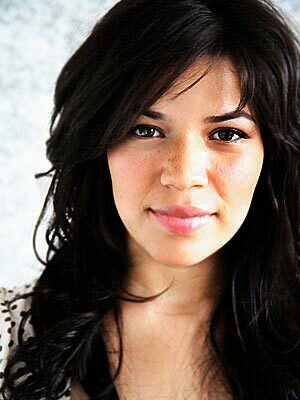 No Comments, America Ferrera Photos, by sms4send. Ugly has never been thisbeautiful! As bushy-browed brace face Betty Suarez on ABC’s Ugly Betty, America Ferrera charmed audiences, made the endearingly hilarious series a must-see hit, and turned herself into a Golden Globe, SAG and Emmy Award-winning star. The sixth and youngest child of Honduran immigrants, Ferrera got her big break in HBO’s Sundance darling, Real Women Have Curves, at age 16. Her breakthrough performance helped her land the teen girlfriend hit The Sisterhood of the Traveling Pants before her Betty fame. Ferrera, who lives with boyfriend Ryan Piers Williams, was saluted by Congress for providing a role model for young Latinas, while landing onPEOPLE’s Most Beautiful and Time‘s Most Influential lists. Ferrera scores a starring role in The Sisterhood of theTraveling Pants, with Alexis Bledel, Blake Lively and Amber Tamblyn (left). The film based on Ann Brashares’ best-selling teen novel centers around lifelong friends who spend their first summer apart, but connect by shipping a pair of jeans to each other. In 2007, Ferrera reprises her role as the intelligent Carmen for the 2008 Traveling Pants sequel.